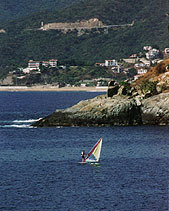 Manzanillo, with a population of around 100,000, has changed from a historic seaport to a world class resort. It's name was derived from the abundant groves of manzanilla trees that were used extensively in the early days of ship building. Located in the state of Colima on Mexico's 'Golden Riviera', Manzanillo is between Puerto Vallarta and Acapulco on the Pacific coast. In recent years, it has become a haven for sun worshippers, sports enthusiasts and honeymooners. It is a romantic setting for a wonderful holiday south-of-the-border. Acclaimed as the sailfish capital of the world, the 70 boat marina is also the final destination of the classic San Diego-to-Manzanillo Yacht Race. Numerous celebrity golf & tennis tournaments are held here every year and one of the three golf courses has been named as being among "The 100 Greatest in the World" by Golf Digest Magazine. The movie "10" was filmed here and this sunny resort has been featured on TV's popular "Lifestyles of the Rich & Famous". Discover the special charm of Manzanillo for yourself. You will find that a holiday here is far less costly than you may have imagined.